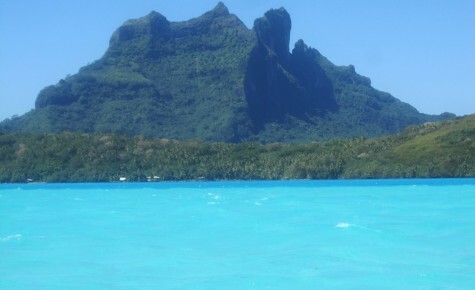 “I’m not really a water baby, I wonder whether I will enjoy this…” were my initial thoughts when I first considered the opportunity of sailing around the Tahitian islands in a small cruise ship. “This trip may be wasted on you then, Monica” was the response I got from my colleagues. No one could have been any more surprised than I was to discover just how much I loved this experience. A resounding “yes!” followed by several “wows!” was what colleagues had to listen to upon my return, as I recalled the magnificent memories of the destination, and in particular, the way in which I experienced it. French Polynesia comprises of 118 islands dispersed over 2000km in the South Pacific and I had a luxurious adventure in experiencing 6 of these very different islands from the elegant Windstar Wind Spirit sailing vessel. While not strictly reliant on its sails for navigation, watching them being raised to the sounds of evocativ e music from the ship’s four masts provided a delightful sense of romanticism. Wind Spirit carries 148 passengers in 74 cabins and the high crew-to-guest ratio (almost 1:1) meant that service was always attentive, but it was their friendly and exceptionally personalised approach which has stayed with me. The ship’s Open Bridge policy meant that I could interact with senior crew and learn about some of the facts and figures at the Bridge. I was also made to feel special by the hospitality crew as they committed my dietary requests to memory and furthermore, anticipated them without having to be reminded. Oh, and remembering my name after Day One was also very impressive. My Ocean View cabin was adequately proportioned and clever and plentiful storage options, (like being able to stow my suitcase under the bed) and added bathroom features, catered very well to the needs of myself and travel companion. I especially enjoyed the fluffy bathrobe and slippers and exquisite L’Occitane amenities which made me feel pampered and spoilt. The cabin also benefitted from a flat-screen TV (although underutilised) and a DVD/iPod Dock which we did use to play music while we freshened up before dinner. Meals – ah! With the presentation of new menus offered in both restaurants daily, there was absolutely no lack of variety during the 7 nights on board. Breakfast and Lunch was either buffet-style or a la carte and was served in the Veranda – an airy and pleasant place to dine. Tables spilled out on to the teak decks which provided sensational views of the staggered mountains greeting us at each new port. Most evening meals were taken at Amphora – a beautiful venue of contemporary design offering creative menu options, my favourite of which was the local fish “Mahi Mahi”, a deliciously flavoursome dense fish which I found simply irresistible. For those not necessarily wanting a stylish dining experience, room service is available and options included those from Amphora’s creative menu – just so that you don’t miss out! 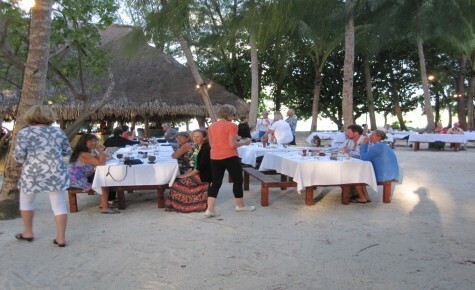 If you are celebrating a special occasion Candles will provide a memorable alfresco dining experience and although it was a bit chilly on the evening we chose to dine, we were offered heated shawls to stave off the breeze – nice! Whether it was the Poolside BBQ evening, Candles, Amphora or Veranda, every meal was deliciously prepared; portion size was enough for most men I know and the service was unobtrusive and efficient. Add to that the dress code – “leave your tux at home”, and dining on board is a very casual, elegant affair. 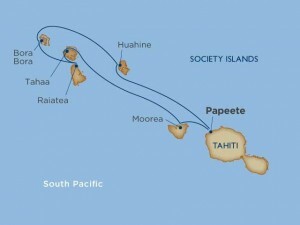 The well-paced itinerary is aptly named, “Dreams of Tahiti” and over a period of 7 nights, there are a couple of 2-night stay-puts at Raiatea and Bora Bora. This provided ample time to explore these two islands in greater detail while also providing me with an opportunity to snooze a little later on these mornings, given my sensitivity to motion sickness. The complimentary seasickness tablets on offer worked a treat, to the point where some of our party commented that the movement became soothing, akin to being rocked in a cradle! Be it, culture, landscape, scenery or marine life, there are many Shore Excursions from which to choose and I decided upon Kayaking the Faaroa River in Raiatea and Snorkel Safari and Stingray Encounter in Bora Bora. The Faaroa River is the only navigable river in Tahiti and even though it rained from the moment we stepped in to the kayak until we disembarked, it certainly did not detract from the experience. In fact, I felt it enhanced it by creating a mystical atmosphere of faint mist, shrouding the rainforest in mystery. My kayaking buddy and I found that, as novices, we wound up in the reeds a few times and chuckled at the challenge of ‘reversing’ but certainly were never in any danger, despite the guide’s warning to be on the lookout for falling coconuts! A thoroughly enjoyable soft adventure. As with the Kayaking adventure, the Photographer’s Eye View of Moorea Excursion was run by a local Tahitian of French descent and my travel companion, an avid photographer herself, was very impressed with the level of professionalism and knowledge she gained on this Excursion. On this day, I chose to take a drive around the island of Moorea, along with a few others and Albert, our trusted driver and guide provided a fascinating commentary about the history of the various points of interest along the way. 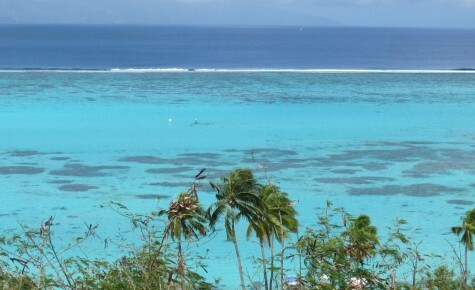 The island of Tahaa was an extraordinary experience. Windstar tendered out to a private island for the day, bringing along with them enough supplies to cater for the hundred-odd passengers on board, a veritable beach BBQ complete with live musical entertainment as provided by the Duo who also serenaded us with song in the Lounge each evening. The island was set up with options for beach volley ball and kayaking if preferred. After a sumptuous BBQ lunch, I spent the afternoon snorkelling just 5 metres from the shoreline in a most abundantly rich coral wonderland where I spotted at least 27 different varieties of fish. 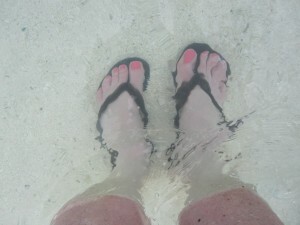 This was my favourite day by a country mile – so much to see in crystal clear water, all within metres of my deck-chair. Truly sensational! 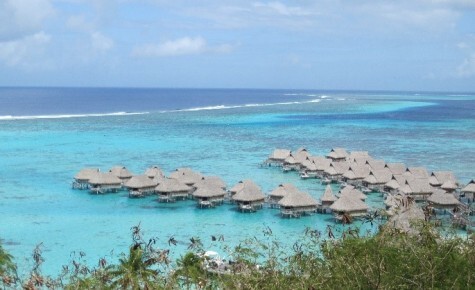 Bora Bora presented an equally enthralling adventure in the form of the Excursion I chose – a Snorkel Safari and Stingray Encounter. It was a windy day and the sea was rougher than the guide might have liked, which meant that we had to have our wits about us out at the reef’s edge but the promise of viewing Stingrays for the first time, swirling round my legs, being close enough to touch (but daren’t!) was too exciting to miss. Admittedly, the rougher than usual seas meant that we all stayed very close to the safety line but watching these magnificent stealth-like relatives of the shark emerge and circle us was a wonderfully exciting privilege I shan’t easily forget. As we had 2 nights in Bora Bora, the second day saw us taking the tender to the island and from the pier, a 10 minute taxi ride to the sparsely populated public beach where the colour of the water exceeded my expectation and clarity of the same meant that every freckle on my body could be seen below the water line. After the swim I had my favourite Mahi Mahi in the form of a burger and a local beer at the famous, “Bloody Mary’s” restaurant. A time-honoured establishment where sand adorns the floor and where many celebrities have dined and enjoyed walking barefoot on the same. For about NZ$30 we had an afternoon of fun in the sun on an island so often deemed out of reach for the average traveller. Not anymore! 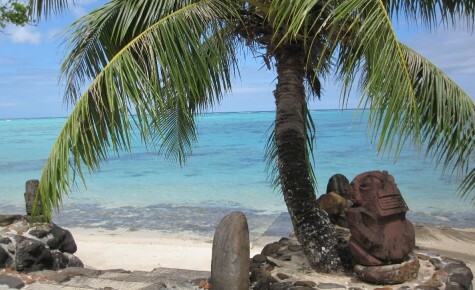 Last stop was the island of Huahine – this island’s nickname is the “Garden of Eden” and lush forests, tropical vegetation and quaint villages which dot the island offer an insight into an authentic South Pacific lifestyle. Here we used the free shuttle, Le Truck, to pop in to the main village and enjoyed a dip in the water from the shore of the small, but beautiful, local beach. A couple of Hinano beers (local, approx. NZ$8-9) later and a bit of sun on our backs and all the worries of the western world seemed a million miles away. Back on board, in the late afternoon heat, I quick dip in the ocean from the Water Sports Platform at the rear of the ship cooled me down which meant a dip in the hot tub followed, before it was time for one last night on board the very beautiful Windstar Wind Spirit. I cherish the friendships made with my fellow like-minded travellers, whose average age was 50 and whom hailed from the likes of New Zealand, Canada, USA and Australia, Brazil and Argentina and all sharing one commonality – the love of small ship cruising. The typical small ship passenger enjoys the opportunity of exploring a destination which a bigger vessel is unable to reach. It attracts more active and well-travelled individuals, both solo travellers, honeymooners and the ‘baby-boomers’ who all appreciate a relaxed, casual, beautiful ambience on board. Both Windstar and these Tahitian island have left me an indelible impression on my mind as a ‘must do’ for anyone interested in discovering bountiful marine life in warm, bluest of turquoise waters, experiencing a vastly different way to relax on holiday and moreover, for those who enjoy small ship cruising which, given its size, felt far more like my own private yacht.